If you are serious about fitness, you no doubt put a lot of time and effort into exercising. Regardless of whether you run, spin, swim, lift weights, or do interval training, you may be able to get more out of your workout through the use of sports massage. The basic concept behind the idea of this type of massage is relatively simple. In essence, massaging the muscles to reduce pain and soreness can allow you to get more out of each of your training sessions. This, in turn, can help you reach your fitness objectives more quickly. The benefits of massage don’t end there, however. The regular use of massage can also help you become more aware of your body, enabling you to make more informed choices when it comes to your training. For instance, if something doesn’t feel quite right with a particular part of your body during your massage, it may be an indication that you need to adjust your workout routine to reduce the chance of injury. Modifying your technique or the intensity of your workout based on how your body is feeling gives you the ultimate control over your results. Additionally, massage can help relax the mind, helping you stay focused on your long-term goals. Sports massages, however, aren’t quite the same as a typical massage. Oftentimes, they incorporate intense techniques such as deep tissue massage or muscular manipulation. Myofascial release is also becoming increasingly popular with athletes. This technique helps loosen up the muscles and connective tissue of the body. Your muscles are surrounded by fascia, which is a thin layer of fibrous tissue that provides support. Leading a sedentary lifestyle or performing repetitive actions can tighten up the fascia, restricting the muscles as a result. Myofascial release is designed to loosen up the fascia so that the muscles can move more freely, helping you to get a better workout as a result. In order for your muscles to work as effectively as possible, they need oxygen. Researchers at the University of Illinois found that massaging the lower body for 30 minutes after working out the legs improved the dilation of blood vessels in people who participated in the study for as long as 48 hours. Blood vessels that are better able to dilate do a better job of carrying vital oxygen and nutrients to the muscles and other bodily tissues. Based on the results of the study, it seems likely that the overall function of the blood vessels in your body can be improved through the use of massage. Getting a massage after a workout can help reduce the amount of soreness or stiffness that you feel. When you exercise your muscles, it creates tiny tears in the muscle fibers. These tears can cause inflammation in your muscles, resulting in soreness. When you overwork your muscles and put them under too much stress, the inflammation and tissue damage can keep them from functioning optimally during the following days. Getting a massage after a workout, however, can help reduce inflammation, minimizing pain and stiffness as a result. A study done at Ontario’s McMaster University found that massage increases mitochondrial signaling. Mitochondria are responsible for converting fuel into usable energy. This effect is believed to be the result of the physical pressure from the massage. The pressure alters the environment inside the cells of the muscle. This, in turn, changes the gene expression, boosting signaling that can increase mitochondrial growth, resulting in an overall increase in muscular endurance. Based on the results of this study, it may be possible to boost the endurance of your muscles simply through the use of sports massage. Tight muscles, back pain, and other tension in the body can restrict movement, making it difficult to perform certain exercises. Sports massage for lower back pain or for other parts of the body can help release tight fascia that could be reducing your range of motion. Increasing mobility and flexibility can make it easier to exercise. As a result, you may be able to lengthen the duration of your workouts or to push yourself just a little bit harder. If you want to get the best results, you should visit a qualified massage therapist. In some cases, however, that may not be practical. A good alternative is to try self-massage. Here are some tools that you can experiment with. Try using them after taking a bath so that your muscles will be warm and limber. The Rolflex. This unique massage tool takes the concept of a foam roller to a whole new level. It can be used on every part of your body to promote myofascial release and a reduction in muscular tension. This ball-shaped massage tool is designed to loosen muscles and fascia throughout the body. The tool, which also vibrates, is easy to use. All you have to do is roll it over any areas where you have tightness such as your lower back, hamstrings, or feet. Designed from a stiff plastic material, this unique tool has integrated claws that are designed specifically for breaking up fascia. It can be used on any part of your body and is a good alternative to softer foam rollers. Self-massage with the use of these tools can help increase your strength and boost your flexibility. It can also improve your range of motion by eliminating tightness in the muscles. After a workout, it can minimize the chance of stiffness and can help you recover more quickly. Additionally, it can help reduce the risk of injuries while at the same time promoting relaxation. 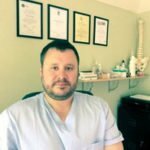 Richard Reed is an osteopath in Farnham. He is a founder and owner of Back to Active Osteopathy and Sports Injury Clinic. Richard has years of experience as a sports massage therapist and is currently the Assistant Head Coach for Farnham Swimming Club.